Traces of the Darkness Invisible. Note: There are a lot of ‘allegeds’ inclusions here, and I’ve probably (unintentionally) missed many more. The official reports and accusations are questionable (to put it mildly), and have been intelligently questioned by competent investigators. The world awaits proper ‘official investigations to establish the facts of these world-changing events that have invoked unimaginable numbers of deaths, suffering, environmental pollution and destruction leading to mass movements of human populations. Notice the 1 and 7 in the heading – 1 and 7 combo. London and the date of the atrocity totals 4. As I wrote in Part 1, combinations of 1 and 7, features strongly in events where a long term secret plan is realised or made public. It turns up again at Tavistock Square. Yet another powerful duo, that I have highlighted in previous articles, is 4 and 7 (especially 7 when it derives from 16). They too, like 1 and 7, feature heavily at Tavistock Square. When these two get together there is otherworld activity abroad. 4 is ‘earthed’, 7 is a path to the heavens. It’s secret, unseen, you could say, ‘underground and sub’ (bus reversed). Together they total 11 (two 1s). Energy is multidimensional in nature as are numbers. Numerosymbology, being a multidimensional discipline, reads them like a book. 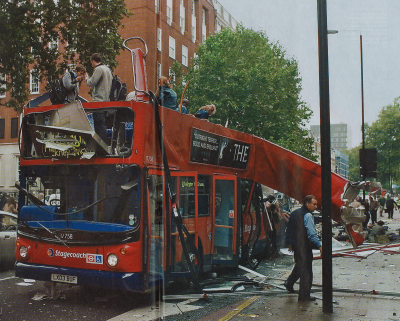 In this article I am only taking brief looks at the Tavistock Square, London, and the USA’s 911 incidents. Before we do though we will just notice the presence of 1, 4 and 7 in the publicised facts of 7th July 2005. London allegedly had 4 bombers. London: 52 civilians (5+2 = 7) were killed and over 700 more were injured. It is alleged that the first bomb exploded at 8:49 am and the other two within 50 seconds of that. Was it detonated a little early in error, or only reported to be at this time, or was the clock wrong? Just a thought because 8:49 give 50 seconds takes us into 8:50 = 13 = 4. 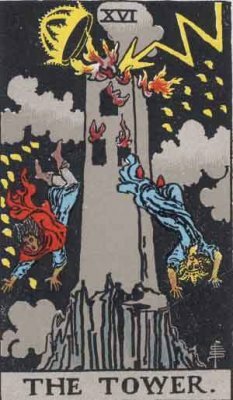 Mind you, in minutes 8:49 is 529 minutes – 5+2+9 = 16 The explosive Tarot card, the Tower..and 1+6 = 7. Added to this, the last explosion, which was on the bus, is reported to have occurred at 9:47 am, which is 9:11, numerologically. The bus exploded (taking its roof off) in Woburn Place (11-9), at the junction of Endsleigh Place (which is rather suggestive, name-wise), in direct line of sight from the Post Office Tower, aka BT Tower, aka ”Location 23” (last photo above). The techno beaming arrangement on top of the BT Tower – BT = 28+46 = 74 = 11 – 7 & 4, brings the total height to 191 metres – numbers matching the Numerosymbology of Woburn Place – numbers, of course, we are familiar with too, and will feature shortly. 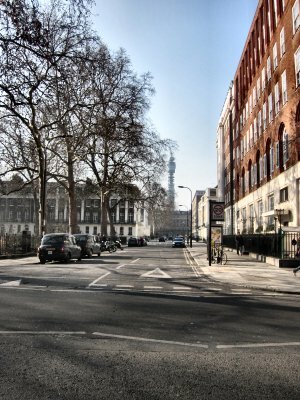 Have a ganda at the Wikipedia page for the BT Tower. 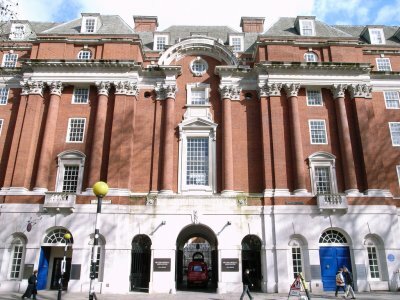 Like the BMA building below, it is certainly no stranger to the occult, its workings and secret agendas. You will also note many of the numbers that this article features. 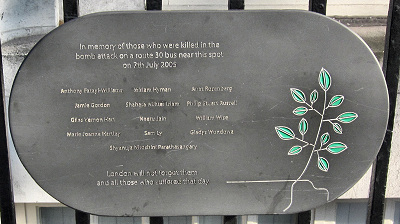 A commemorative plaque is fixed to the railings of the British Medical Association‘s HQ near the site of the bus explosion (see photo above). The building was designed by Sir Edwin Lutyens for the Theosophical Society. Work began on the construction 3 September 1911 – a clearly calculated 33-date. 911 allegedly had 4 planes involved. 4 buildings: WT’s 1, 2, and 7 in Manhattan, the Pentagon in Virginia…and a hole in the ground. Building 7 not only went down in sympathy, it was late… or the BBC was early. No missile or plane, that we could see anyway, hit it. Though David might have slung a shiny stone at the Goliath. Flight AA11 (adds to 9-11 and 11): ‘a crew of 11 and 76 (7+6 = 4) passengers, not including five hijackers.’ Including the 5 hijackers – 11-9. UA175 (UA = 47+ 27 = 11-9 and 11. 175 adds to 4): ‘a crew of nine and 51 passengers, not including five hijackers.’ (65 total = 11.) Including the 5 hijackers – 9-11. AA77 (Note the 7s. Adds to 5. Claimed to have hit the pentagon, a 5-structure. Stated crew, passengers and ground victims’ numbers (53 passengers, 5 hijackers, 6 crew, 125 people in the Pentagon, don’t fit the 7, 4, and 11, or 9-11 numbers, but do match the Numerosymbology of the name, ‘Pentagon’. UA93 (UA = 11-9. The full number is 140 = 5 – a bridge from AA77 – and fits the departure time: 8:42 a.m (8+4+2 = 5). The alleged time of the crash is 10:03 a.m. – 13 = 4). A crew of 7, 33 passengers and 4 hijackers – 44. (Number 17 features as the total number of days between the alleged crash of Flight 93 in America (at 10.03) and those in London – 1394 days (1+3+9+4) and also in the number of hours (17). From the alleged time of the alleged plane’s take over (15 minutes after take-off from Logan Airport, Boston) to the alleged crash of UA93 is 1395 days, 0 hours, 33 minutes and 0 seconds. 33, the number of the minutes, and the passengers, in UA93, most readers are familiar with. This entry was posted in Numerosymbology articles, Uncategorized and tagged 911, BT Tower, GPO Tower, london bombings, Tavistock Square. Bookmark the permalink.